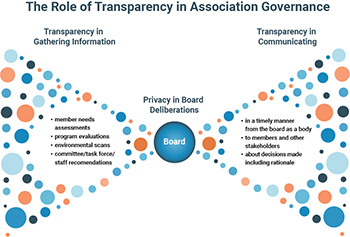 Education on transparency and its proper role in governance is vital for associations, and boards can function most effectively by balancing transparency and privacy. Members should expect the board to be transparent in the tools and resources they use to gather information as well as in the timely communications of important board decisions. On the other hand, research shows that groups function more effectively in environments in which they feel safe to be open with each other about what they know and don’t know, and to change their minds, and the visibility created by transparency can foster a climate of self-consciousness and inhibition. Board members are advised to be open and intentional (transparent) in seeking all available information about members’ needs and interests, but board deliberations, board member voting records, and other aspects of board deliberations should remain private to allow the board to consider diverse points of view and have the difficult conversations that are so essential to organizational performance. Read and download The Role of Transparency in Governance by Mark Engle, DM FASAE CAE, Anne Cordes, CAE and Jed R. Mandel, Esq.